Oh hey look, it's a new scarf! But, I didn't buy this one, this was an awesome gift from an even more awesome friend. When I got home from our Christmas trip and opened this package, I was super excited to style it. I decided to pair it with blues - especially since I haven't busted out this cobalt moto jacket yet this season! About a year ago, I put together this post, which seriously has gotten pinned at least once every day since the post went live. Yay for exposure, but at the same time - I wish I could come up with a second post to go viral! Ha! A few weeks later, I did a spin off of that post, which was basically the same information but in video form - you can refresh yourself with that here. I remind you of these posts because one year later, it's still my absolute favorite way to tie a scarf. It instantly dresses up your entire outfit and puts the scarf perfectly and prettily on display. This scarf tying method basically makes every scarf look like a blanket scarf, just without the actual bulk of the blanket. Perfection. If you missed it yesterday - don't miss out on the $225 Nordstrom Giveaway! Enter using the rafflecopter below! Linking up for: Tuesday Talk, Tremendous Tuesday, #AllAboutYou, Erin and Laura for Trend Spin Linkup, Thrift Sisters with Ayana and Keren, What I Wore Wednesday, Random Wednesday, I Feel Pretty, Whatcha Wearin Wednesday, Oh, Hey Girl! Your scarf-tying skills are second to none, girlfriend. :) And I love this bright, happy print! Love the bright colors and the print of your scarf! pretty scarf and loving this cobalt jacket. Beautiful scarf...adore it with the blues you've got it paired with. I love your scarf tying video...it takes me a few time before I actually remember how to do it, so I definitely keep this for reference. And I sooo understand why you're saying about that "one" pin going crazy....I have one about infinity scarves that is a mega hit, which I'm thankful for, but I'd sure love another one or two that get some exposure too....lol!! Well, I never knew you were a Cache shopper! That jacket is gorgeous. (I know this is about the scarf but I'm not looking at scarves because I can't buy them! LOL) But you are indeed the scarf-tying master! 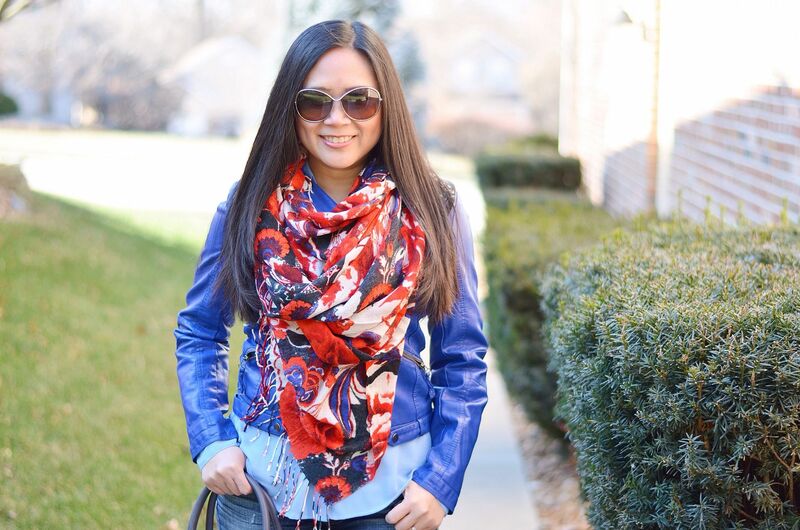 That scarf is so pretty, and I love it paired with that cobalt moto jacket! So cute! Great scarf and love the way you tied it! Oo I love the cobalt moto jacket! I was very intrigued about what post went viral and I totally remember that! Genius way to tie a scarf, glad I found it again so I can remember to use it haha! I love scarves but don't think I've ever tried this method! Would love to get the blanket scarf look with some of my thinner scarves! And yay for creating such highly pinned post! Love this new scarf on you - such pretty colours! I love styling a new scarf with items I haven't busted out this season! 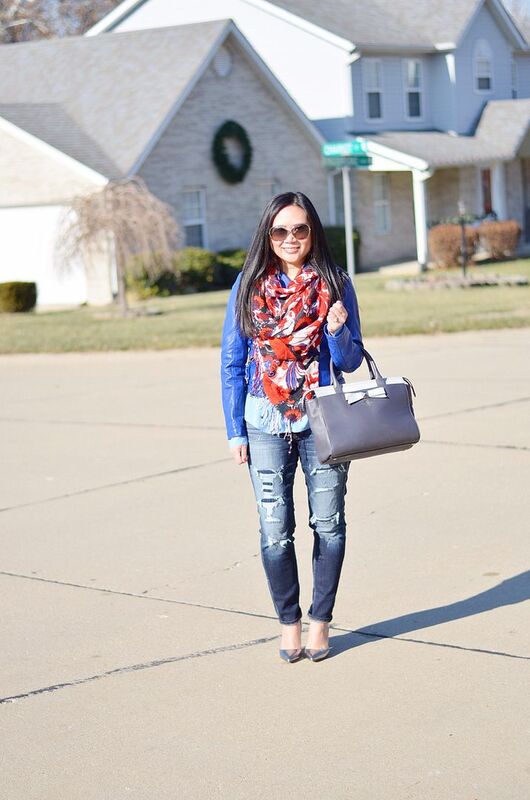 I love the way you styled this scarf, and that blue jacket is beautiful! Great colour. 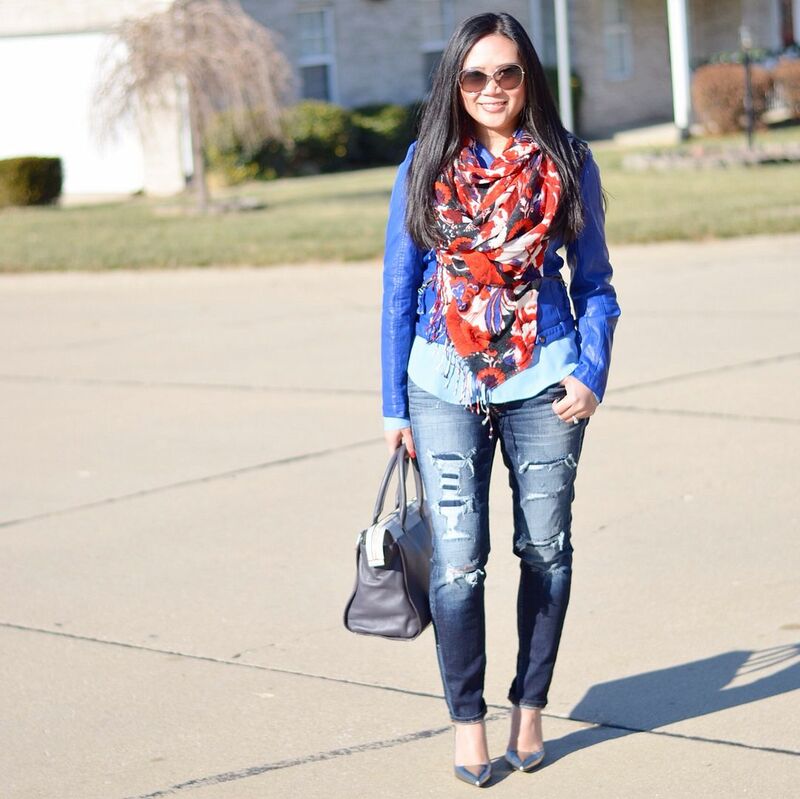 Your cobalt moto jacket is FABULOUS and looks amazing with your scarf! There are so many fun ways to tie a scarf, i love experimenting! I love the cobalt blue - and the scarf! I have a similar jacket at home - and I need to get a similar scarf and give this look a try! Love the outfit especially the scarf! Such a gorgeous scarf! I loooove those fun shoes as well. Great look! I am so loving this outfit. And that scarf is beautiful. Wonderful post. Love this whole look, the orange with the blues and the distressed denim looks great. I think sometimes we need a pick me up from the dreary days of winter. Nice of your friend!! Love this outfit! That scarf tying is just perfect! Love that blue moto jacket! Perfect with your new scarf! This look is by far my favorite of yours! I love everything about it! Happy New Year! So cute! That scarf is so pretty and I love your jacket too! Didn't you just cut your hair girl, it looks super long already! Love this look, especially the cobalt jacket and those heels! Ha! About a month ago! Got 3 inches cut but it was almost to my waist! Eeshk! Thank you!! That scarf really pops against that jacket! Beautiful! That jacket! I love blues and this is such a bright and cheeful outfit for these dreary winter days. Love this whole look. The jacket and the jeans are my favorite. I'm going to look into those jeans when I can. Seriously loving them. That scarf is so pretty! What a great gift. I love the colors in it with the blue in your outfit! You styled the scarf perfectly! Love how electric the blue is! I will need to practice tying my scarf like this - it's so pretty. Love, love, love your motto jacket! That scarf is beautiful and your outfit is just perfect. Such a lovely look for cold months. HAPPY NEW YEAR - looking lovely! LOVE those heels! Adds the perfect bit of fabulous! Thanks so much for always linking up with Tremendous Tuesday! I can see why that post can go viral! I so need to learn how to do a better scarf. That scarf is GORGEOUS! Thank you so very much for linking up with the Thrift Sisters.